Now that Hibbert has come to town and expressed his desire to continue in the great tradition of Jazz centers, I thought it would be nice to take a stroll through memory lane. While Pasty Gangster feels that the Jazz could do worse than draft the Hoya big man, I think history should be the judge of that. (1) The NBA over-values centers: the reward of landing a franchise big man is so great, that teams will draft young centers well before their talent indicates they should be taken. Centers with real potential do not stick around in the draft. (2) Since 1984, the Jazz have had a top 14 selection only once: Deron Williams. Logic, then, indicates that by the time the Jazz draft, all the good big men are gone. Sure, guys like Boozer and Ben Wallace have slipped through the entire first round, but such slippage is usually due to a perceived lack of NBA size. However, the Jazz believe that they can beat the system, convinced that the one year that a Duncan, or an Andrew Bynum, or even a Joel Przybilla slips to the bottom of the first round is going to be the present year. All of this wishful thinking has to do with the 1983 draft. To the casual jazz fan, that draft is best remembered not for the Jazz' selection of Dominique Wilkins, but for the 4th Round selection of a 7''4' auto mechanic from UCLA. 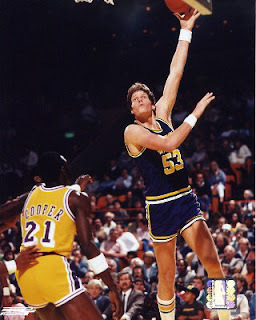 Big Mark Eaton strolled into town and became the fulcrum in the Stockton-Malone success slingshot. Hell, he was even an all-star! And he loves to cook! 2003: Pavel Podkolzine, 21st overall, Russia. The big 7''5' Russian was instantly traded to Dallas for a pick that the Jazz later included in the trade to Portland that in turn netted Deron. Pavel "played" for two seasons with the Mavs while picking up Deron has been a nice thing for the Jazz. Draft Grade: A. So, what has this little history lesson taught us? Drafting for size at number 23 is a total waste. The Jazz should either (1) trade the pick, (2) take an international player, or (3) take a flier on a swingman that drops. Do not draft any of the following: Roy Hibbert, Javale McKee, Kosta Koufos, or DeVon Hardin. The end. An absolute gem of a post. The curse is true! Can Hibbert become O-tag? If so, then maybe... Hey, we're talkin' a backup C.
I agree with Kofoed. What I think Crotty's analysis fails to consider is where we're usually picking in the draft. Anything worse than 17th and chances are the guy is not even going to be on the roster in three years, not matter what position he plays. In fact, I would give Ostertag at the 28th pick an A+. The guy had a long NBA career, started for us for years, and helped us a win a few playoff series. You can't hope for more than that out of a pick in the high 20s. If we can get as much out of Hibbert as we did out of 'Tag, I'd take him in a heartbeat. 1. There are players available in the 20s that are legit NBA players every year. Last year, for example, you have Jared Dudley, Aaron Afflalo, and Carl Landry. All nice players that would be great on the Jazz. 2. While Oster was a good NBA backup, we absolutely KILLED our salary cap paying him the money we paid him. Although he was a decent player, we overpaid him so much that we couldn't get a legit small forward in free agency with John and Karl around. The curse of Mark Eaton does not just occur on draft day, it can infect the club's future. I suggest that we up the grade for drafting OTagg because (1) he had a great hair cut, (2) he brought out the best in Karl Malone, and (3) he donated his kidney to his sister who is like 5'6" and probably now has the biggest kidney in relation to her body size in the world.